German rabbi, and leader of Orthodox Judaism; born at Halberstadt May 20, 1820; died at Berlin July 12, 1899; son of R. Löb Glee Hildesheimer. He attended the "Hasharat-Ẓewi" school in Halberstadt, and, after reaching the age of seventeen, the Talmudic school of Rabbi Ettlinger in Altona. The ḥakam Isaac Bernays was one of his teachers and his model as a preacher. While studying rabbinics Hildesheimer was also devoting much attention to classical languages. In 1840 he returned to Halberstadt, took his diploma at the Dom gymnasium, and entered the University of Berlin. There he studied Oriental languages and mathematics, continued his Talmudic studies, and became a disciple of the dominant Hegelian school. In 1842 he went to Halle and continued his studies under Gesenius and Roediger (Ph.D. 1844, his dissertation being "Ueber die Rechte Art der Bibelinterpretation"). Hildesheimer then returned to Halberstadt, and married Henrietta Hirsch, sister of Joseph Hirsch, head of the firm of Aron Hirsch & Sohn of Halberstadt. In 1851 he was called to the rabbinate of Eisenstadt (=Kis-Marton), Hungary. His first notable act there was to found a parochial school, in which correct German was used, and in which German principles of pedagogy were adopted, in teaching Jewish as well as secular subjects. Hildesheimer next established a rabbinical school, which within a few years attracted a large number of pupils. The introduction into the school of German methods of instruction and of secular branches of learning was resented by the Orthodox party in Eisenstadt, a resentment which Hildesheimer's liberal tendencies and sympathy with modern culture soon changed to positive antipathy. This feeling became so strong that the rabbinical school was denounced before the representatives of the government at Oedenburg, the result being that the government ordered the school closed within twenty-four hours and the pupils removed from the city. 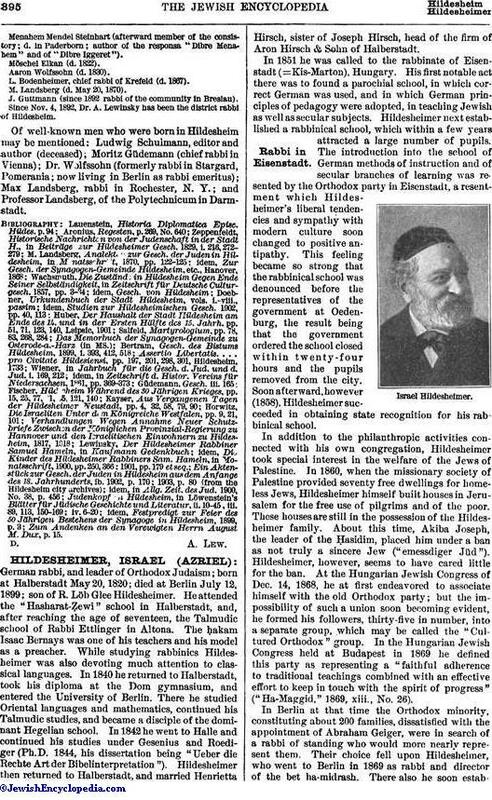 Soon afterward, however (1858), Hildesheimer succeeded in obtaining state recognition for his rabbinical school. In addition to the philanthropic activities connected with his own congregation, Hildesheimer took special interest in the welfare of the Jews of Palestine. In 1860, when the missionary society of Palestine provided seventy free dwellings for homeless Jews, Hildesheimer himself built houses in Jerusalem for the free use of pilgrims and of the poor. These houses are still in the possession of the Hildesheimer family. About this time, Akiba Joseph, the leader of the Ḥasidim, placed him under a ban as not truly a sincere Jew ("emessdiger Jüd"). Hildesheimer, however, seems to have cared little for the ban. At the Hungarian Jewish Congress of Dec. 14, 1868, he at first endeavored to associate himself with the old Orthodox party; but the impossibility of such a union soon becoming evident, he formed his followers, thirty-five in number, into a separate group, which may be called the "Cultured Orthodox" group. In the Hungarian Jewish Congress held at Budapest in 1869 he defined this party as representing a "faithful adherence to traditional teachings combined with an effective effort to keep in touch with the spirit of progress" ("Ha-Maggid," 1869, xiii., No. 26). In Berlin at that time the Orthodox minority, constituting about 200 families, dissatisfied with the appointment of Abraham Geiger, were in search of a rabbi of standing who would more nearly represent them. Their choice fell upon Hildesheimer, who went to Berlin in 1869 as rabbi and director of the bet ha-midrash. There also he soon establisheda religious school and a rabbinical seminary for Orthodox Judaism, which thirty former pupils of his at once entered. Thus he became the real intellectual founder and leader of the community 'Adat Yisrael. Hildesheimer, aided by Mayer Lehmann, the editor of "Israelit," in Mayence, exerted his whole energy in the fight against Reform. As early as 1847 he had energetically opposed, as the representative of the communities in the Magdeburg district, the Reform attempts of Ludwig Philippson; in 1861 he took his stand against Abraham Geiger by criticizing the latter's pamphlet, "Notwendigkeit und Mass ciner Reform des Jüdischen Gottesdienstes" (Mayence, 1861). In an address delivered at his rabbinical seminary and defining his own position he said: "Unconditional agreement with the culture of the present day; harmony between Judaism and science; but also unconditional steadfastness in the faith and traditions of Judaism: these constitute the program of the New Community, the standard round which gather the Israelites of Berlin who are faithful to the Law." This firm conviction that traditional Judaism need have no fear of the light of European culture determined his attitude and his activity in Hungary and Germany from the start, and gave him the strength of a man with a definite aim. It is evident, however, that Hildesheimer, who would listen to no compromise, was destined only to widen the gap between the Reform and the Orthodox Jews of Germany. 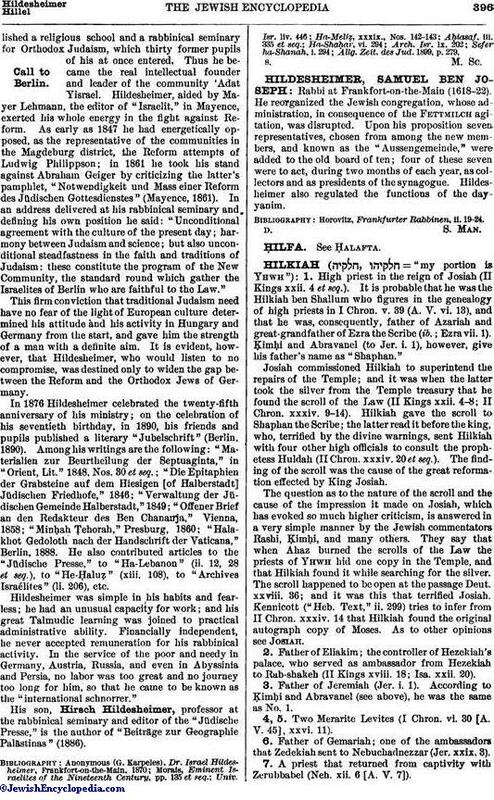 In 1876 Hildesheimer celebrated the twenty-fifth anniversary of his ministry; on the celebration of his seventieth birthday, in 1890, his friends and pupils published a literary "Jubelschrift" (Berlin, 1890). Among his writings are the following: "Materialien zur Beurtheilung der Septuaginta," in "Orient, Lit." 1848, Nos. 30 et seq. ; "Die Epitaphien der Grabsteine auf dem Hiesigen [of Halberstadt] Jüdischen Friedhofe," 1846; "Verwaltung der Jüdischen Gemeinde Halberstadt," 1849; "Offener Brief an den Redakteur des Ben Chananja," Vienna, 1858; "Minḥah Ṭehorah," Presburg, 1860; "Halakhot Gedoloth nach der Handschrift der Vaticana," Berlin, 1888. He also contributed articles to the "Jüdische Presse," to "Ha-Lebanon" (ii. 12, 28 et seq. ), to "He-Ḥaluẓ" (xiii. 108), to "Archives Israélites" (li. 206), etc. Hildesheimer was simple in his habits and fearless; he had an unusual capacity for work; and his great Talmudic learning was joined to practical administrative ability. Financially independent, he never accepted remuneration for his rabbinical activity. In the service of the poor and needy in Germany, Austria, Russia, and even in Abyssinia and Persia, no labor was too great and no journey too long for him, so that he came to be known as the "international schnorrer." His son, Hirsch Hildesheimer, professor at the rabbinical seminary and editor of the "Jüdische Presse," is the author of "Beiträge zur Geographie Palästinas" (1886). Allg. Zeit. des Jud. 1899, p. 279.